Yahoo! Buzz officially opened up for public use on Tuesday after months of being in beta. 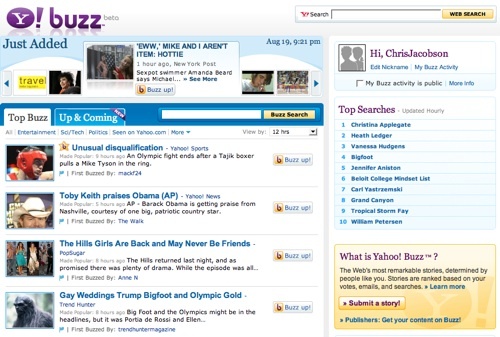 The new social bookmarking site is similar to Digg, in which users can vote popular Internet news stories up and down. As with any other social bookmarking site, this is just another opportunity to gain massive amounts of traffic for your blog. While the traffic from such sites like these is only very temporary, with the right tools and methods, you can gain significant long term exposure and backlinks. My advice to you is not to rely purely on social sites to get traffic, but use traditional methods such as article writing, search engines, forum marketing etc.